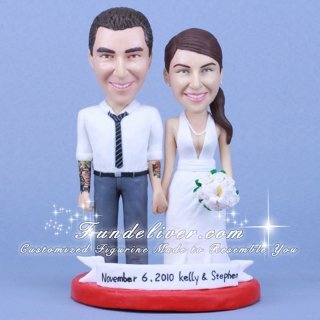 This is a completely customized tattoo wedding cake topper ordered by one of our customers. They would like the figurine to be standing there holding hands and bride on groom’s right side holding white roses, lilys and gardenias. She is with eye makeup on (gray shadowy eyes) and a natural lip color, wearing a pearl necklace and diamond studs in her ears. Also she has an athletic build in her dress. It’s a white Marilyn Monroe inspired dress with the back all open showing her tattoos on her back. They would like the groom, who has an athletic build, to be in a white long sleeve button down shirt, loose fitting tie (black and grey diagonal stripes on the thick side), with the shirts sleeves rolled up and with his tattoos showing (see above pictures). On his right arm is a full sleeve of tattoos and on his left is just the MOM tattoo on this forearm, his figurine is in grey tux pants and black shoes. 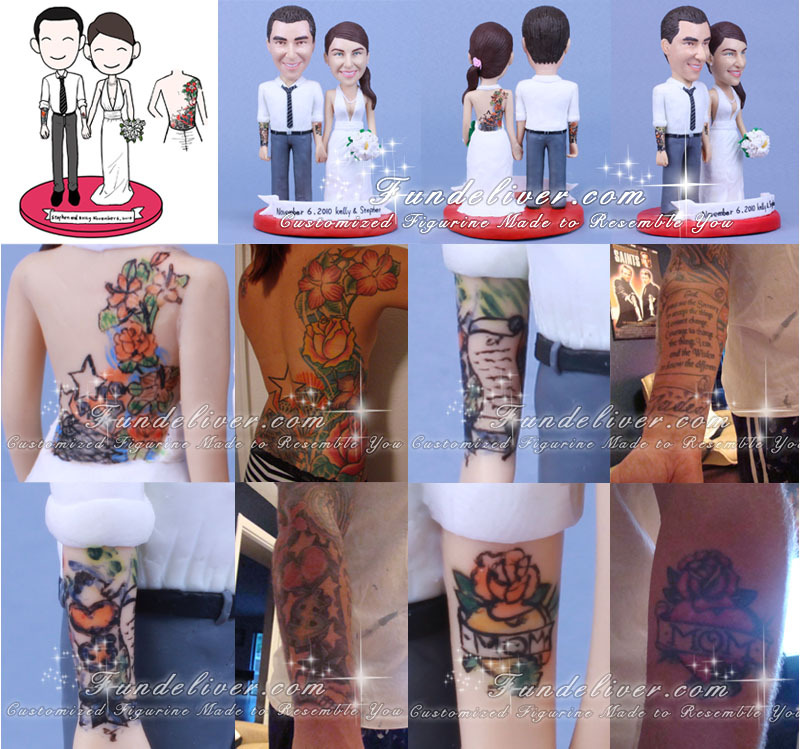 We need 2 months to complete such complicated tattoos, so for our clients who are interested in this tattoo wedding cake topper, if your tattoos is complicated as above, please try to place your order as early as possible. Thanks.